We all need to relax. Okay, maybe some of you are chill but I know that I need to take some deep breaths multiple times a day to keep it together. 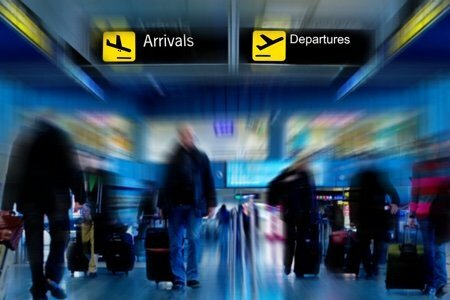 The airport is one of the worst places for stress that I know. Don’t agree with me? Let me try out a few words for you: security….delays….weather….no leg room…..crappy food…..packed lounges….luggage…. I recently flew through Dallas/Ft. Worth which is a hub for American Airlines. 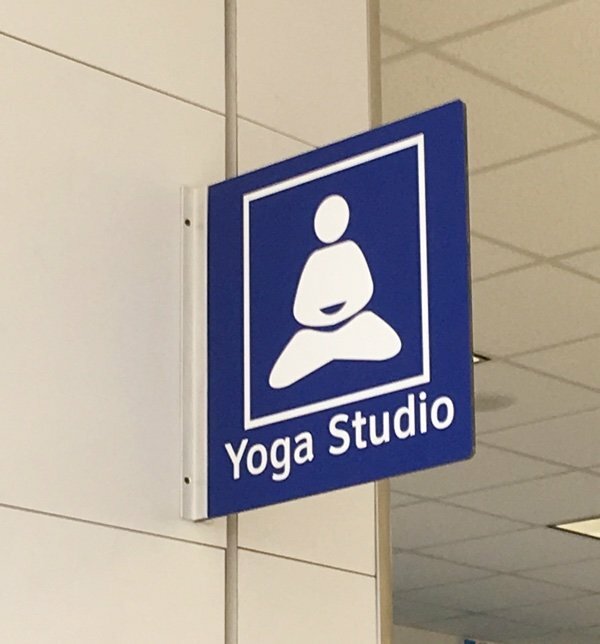 I was stuck there for 5 hours and I had read that there was a yoga studio IN THE AIRPORT. I invited my family to come with me but they didn’t want to chill out. So, I went on my merry way to find this relaxation space. The volunteer who shared with me its location had never been there (tsk tsk) and didn’t know exactly where it was. After multiple moving sidewalks, escalators, and a train, I kept walking and walking to a place in the airport where there weren’t any passengers. It was a bit creepy and I was about to turn back when I saw it! Does this image make you think of giving birth? 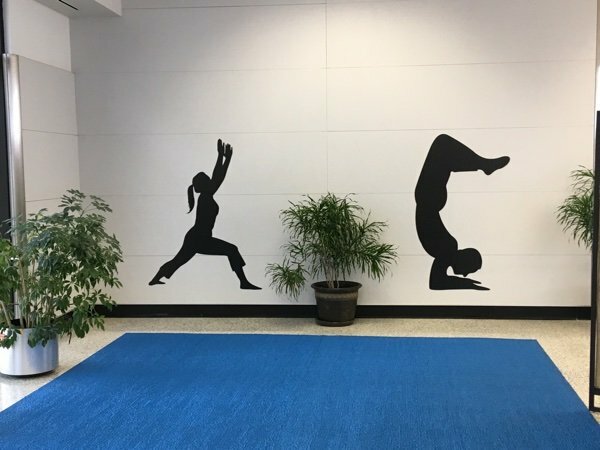 At any rate, this must be the international sign for yoga studio because there it was between gate B1 and D40 (and DO NOT ASK ME IF THAT MAKES SENSE). I was excited to join my fellow yogis in our common practice but there was no one else there. Yogis??? I went ahead and checked out the space thinking that everyone would be joining me soon. Someone had thoughtfully put some mats in the space for common use (as well as spray to disinfect them) so I grabbed a mat. The view was like no other yoga studio I had visited. There were some plants but other than that you were looking at planes, tarmac, and more planes. The smell was of burnt jet fuel and stale airport air but I did my best to not think about it. I decided to focus inward and do a corpse pose as I felt dead from hours of travelling. It had already taken me 3 trips through security, 2 planes, and one visit to US immigration to get this far. I immediately relaxed with my new friends (shadows on wall). We did some downward dog, mountain pose, and a couple triangles just for fun. I did not attempt that wacko handstand (what was he thinking?). The biggest problem with this yoga studio (other than the lack of fellow yogis) were the random announcements. American Airlines is urgently paging Joe Shmoe. Your flight to Denver is boarded and you need to be at the gate immediately. Joe Shmoe! This is an announcement for the Travel Safety Board. Do not light your hair on fire. I repeat, do not light your hair on fire. Stuff like that. Every time I would get calm another urgent announcement would interrupt my bliss. But, it was far better than having no yoga studio and I communed with the television instructor that they had provided SINCE NO ONE ELSE SHOWED UP. Yogis??? I know it sounds funny but I don’t think there are enough spaces for decompression in the world. Perhaps if I went to church that would help. I would love to hear about spaces that you have found that allow you to relieve stress as part of your day. Honestly if you can relax doing yoga at an airport you are a calmer person than me. Best to put on your headphones and listen to some soothing music while waiting for your flight. I got a chuckle from this one, Lisa! You sure know how to make 'lemonade'. And I agree with all the places you've listed to have a yoga studio...the DMV sure could use some help ... that place is the biggest mess! Lisa, this is spot on! I wish there were more yoga places everywhere. I'm always amazed watching babies how they do yoga type moves when they're just "hanging out". 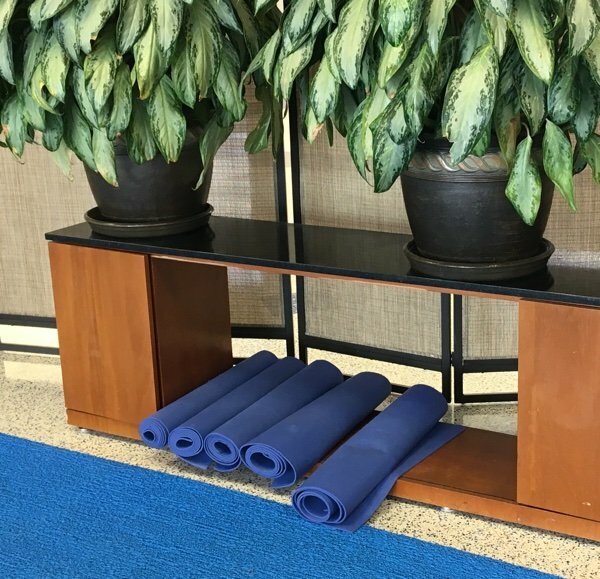 Nursing homes, schools and libraries could use yoga places. After all, the yoga pants are pretty mainstream now, so everybody is practically ready to pose at any time! 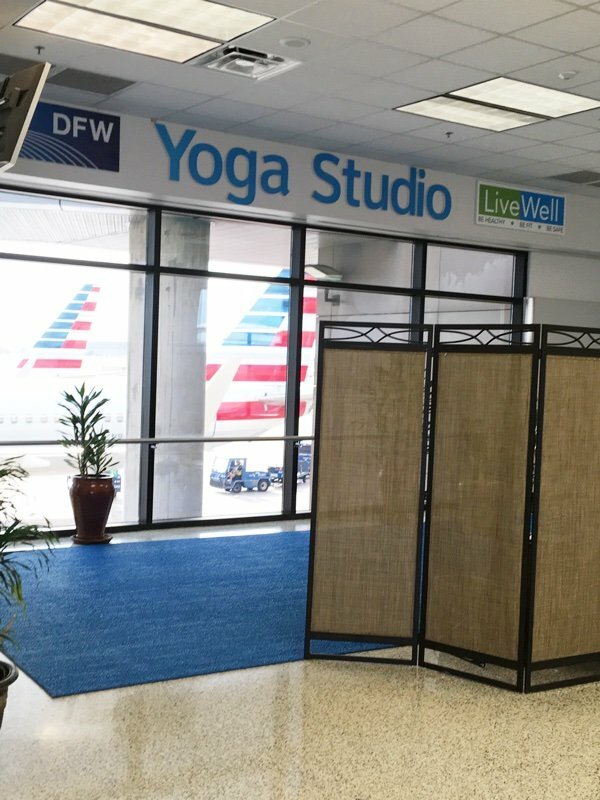 If airports can offer yoga studios, why can't they offer an information booth or the old fashioned 'traveler's aid' stations?? I've always started my day with a crossword and during nice mornings putt around in flower garden, weeding, sipping coffee. smelling the morning, enjoying the birds. By having ''me time'' to start the day I'm ready for anything. San Francisco Airport also has a yoda studio in Terminal 2. It has no windows but it is fairly new and very nice. 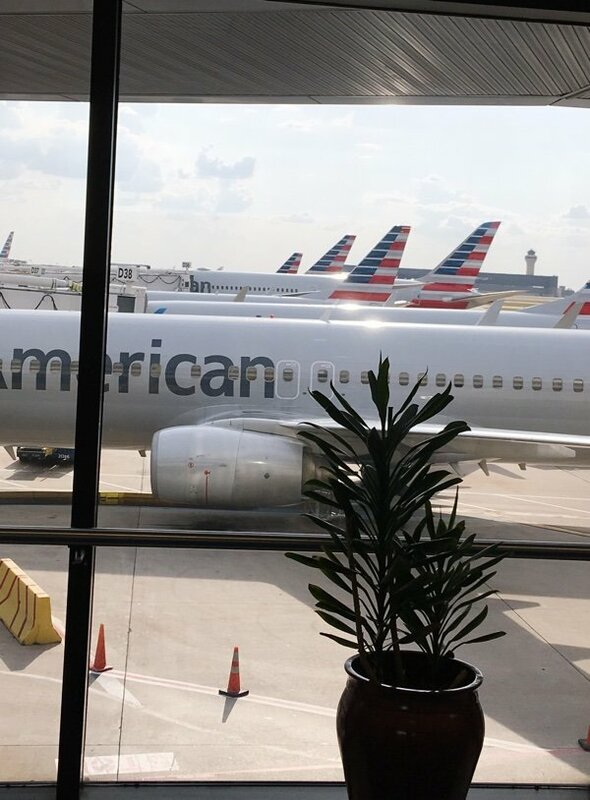 Here is the exact location - Secure Connector between Treminal 1, Boarding Area C, and Terminal 2, Boarding Area D.
Other than church, my best place to decompress is in my pool in the backyard with the sunshine, fresh air, and cloud formations. It’s kind of my therapy doing laps. Jesus is the only way to get complete peace. I have been doing yoga for 20 years and feel refreshed and decompressed afterwards, but I know it's because He is working through the practice. I travel a lot for work and I do yoga in the Delta Lounge on almost every single trip. I have a travel yoga mat that folds up. I find the quietest spot I can (which is never that quiet) and layout my mat and do my thing. I realize people look at me like I'm crazy, but I get on my next flight feeling much better. When you spend as much time in airports as I do, you should make good use of your time. I play Pokémon Go - airports always have lots of Pokestops and other great gameplay. I had an 8 hour lay over in Orlando and spent most of my time walking between terminals to catch Pokémon. I was glad when my plane finally showed up so I could sit! I like to find moments of meditation in my day. Find a quiet spot and just breathe and enjoy the experience. Or if it isn't as quiet as you'd like, just let it go and tune out the noise.